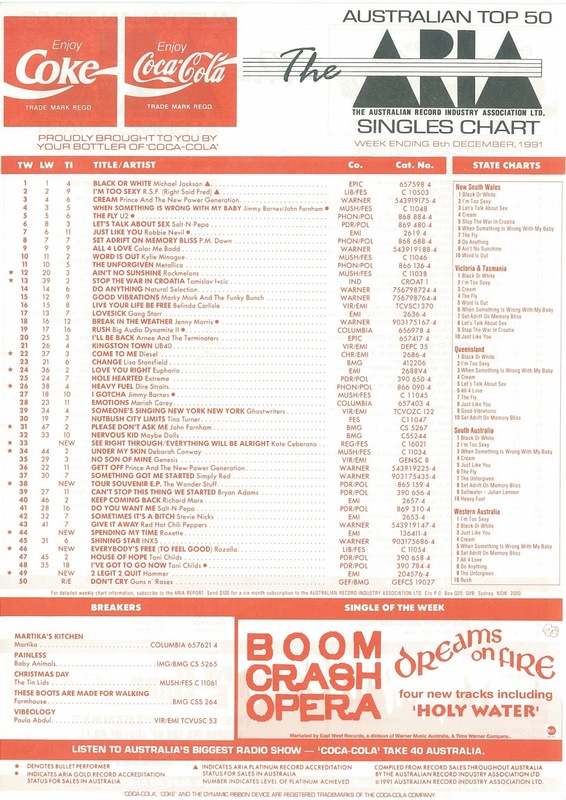 It must have been the warmer weather and the fact that party season had begun, because suddenly dance tunes were doing well on the ARIA singles chart after a number of big club tracks had missed the mark in Australia during 1991. I'm thinking UK top 10 hits by Nomad, K-klass, N-Joi and The Shamen that should've been bigger locally. The much remixed, remade and remodelled "Everybody's Free (To Feel Good)"
Last week, we saw the debut of Euphoria's "Love You Right" and this week one of the biggest dance records of not only 1991 but the entire decade made its presence felt on the top 50. And it's a song we're still hearing in 2016, with it having been covered twice in recent months. Another song that was making its presence felt this week in 1991 was Michael Jackson's "Black Or White", which spent a second comfortable week at number 1. The most successful single by former Fame and future Pretty Little Liars actress Nia Peeples did considerably better in the US, where it reached number 12. Like "Street Of Dreams", this latest single from the Spellbound album made my personal year-end top 100 but performed disappointingly on the ARIA chart. In fact, it became Paula's first all-new single (i.e. not including the remix of "Straight Up") to miss the top 50 since 1989's "Cold Hearted". Locally, the funky "Vibeology" was chosen as the album's third single instead of ballad "Blowing Kisses In The Wind". Even though "Vibeology" didn't do so well, it was probably the right choice, since "Blowing..." didn't even make the top 100 when it ended up being released in early 1992. In the US, "Vibeology" was the fourth single (after "Blowing...") and the bad news continued on the Billboard Hot 100, with the track becoming her first single to miss the top 10 since the initial release of "(It's Just) The Way That You Love Me" in 1988. That didn't stop a fifth single being lifted from Spellbound - and we'll see that reach the Australian chart in mid-1992. Could it turn things around for Paula? Last week, it was one of three songs given Single Of The Week status and now this cover version of the Nancy Sinatra classic registered as a breaker. So who were Farmhouse? Five pretty well known Channel 7 identities, actually - Georgie Parker, who was then a star of A Country Practice; Home And Away's Emily Symons; her Video Smash Hits co-host, Michael Horrocks; and Julie McGregor and Christopher Truswell from Hey Dad..! Thing was, they didn't sing together. "These Boots Are Made For Walkin'" featured just Georgie, while the Farmhouse album was comprised of a couple of solo efforts from each of the five TV personalities - all cover versions updated for a modern audience. In this case, a watered down take on Snap! 's "The Power" was used on "These Boots...". Thankfully, the Australian public mostly showed good taste and declined to turn this into a hit. Oh, MC Hammer - sorry, Hammer (the MC was a thing of the past) - this is the problem with massive success. It makes artists think people want a 15-minute music video from them, so they spend an inordinate amount of money on an overblown, self-indulgent clip packed with celebrity cameos and a bizarre storyline involving James Brown. In reality, all we want is another good song - and for me, repetitive C+C Music Factory rip-off "2 Legit 2 Quit" didn't hit the mark. The lead single from the Too Legit To Quit album was a top 10 hit in the US and the UK, but Australia once again demonstrated impeccable judgement. The timing couldn't have been more perfect for this dance anthem to be released in Australia. With the festive season among us, the breakthrough hit for Zambian-born, London-based singer Rozalla Miller became inescapable all summer. Edgy enough to be a club favourite, commercial enough to be a pop hit, "Everybody's Free (To Feel Good)" is the ultimate party-starter, with its uplifting lyrics and euphoric piano house production. Like so many massive worldwide hits, Rozalla would find it impossible to better the track, even though she had some decent follow-ups like "Faith (In The Power Of Love)" and "Are You Ready To Fly". As well as coming with a couple of different music videos at the time, including this alternate clip and the one below, "Everybody's Free (To Feel Good)" would receive multiple makeovers in the years to follow. A year later, its use in a Coke commercial prompted a re-release and a second visit to the top 50. Remixes followed in 1996 and every few years thereafter, and the track has been covered by artists as diverse as Quindon Tarver (for the Romeo + Juliet soundtrack) and Kylie Minogue. 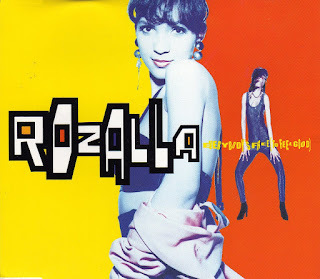 In fact, it was the version by Austrian dance duo Global Deejays, using Rozalla's vocals, that gave the song its highest chart position - number 7 - in Australia in 2009 following its use in ads for So You Think You Can Dance. That's some legacy. Their last single, "The Big L", had become their first to miss the top 10 - and only barely made the top 20. And so, Roxette pulled out another one of their epic ballads for the fourth release from Joyride. Smart move, since "Spending My Time" bucked the usual trend for singles released this late in an album's shelf-life and actually peaked higher than "The Big L". For me, "Spending My Time" is Roxette's final classic single. They released some good songs in the years to come, but none up to the standard of their early run of hits. 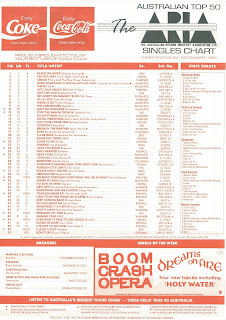 The excellent "The Size Of A Cow" spent two frustrating weeks at number 51, but it's amazing what a local tour and a special release of follow-up single "Caught In My Shadow" could do. The band, who shot the music video for the EP's bouncy lead track outside Birmingham Cathedral, suddenly found themselves in the ARIA top 30. That was good, but things were about to get even better for the band, who'd recently topped the UK chart with a cover version that'd give them their biggest hit here in Australia as well early in 1992. For Kate Ceberano, there was good news and bad news this week in 1991. The good news: her latest single from Satisfied took her back into the top 50 after the disappointing performance of the title track. The bad news: even with two excellent tunes combined as a double A-side, "See Right Through / Everything With Be Alright" could only manage to get to number 33. For me, both this single and Satisfied's first release, "Every Little Thing", ended up in my personal top 40 for the year - but the lacklustre reception both received resulted in Kate pursuing different musical avenues in the years to come and never again venturing into the dance/pop terrain of Brave and Satisfied. Next week: two hits by second generation music acts debut on the chart - one which would slowly work its way up to number 1. Plus, another instant top 5 from the biggest band in the world. And, the chart gets a slight face-lift in time for Christmas. I hadn't heard the Nia Peeples track until it aired on the short-lived music video program 'Power Cuts', with an ARIA chart position outside the top 50. Pity it didn't do better. I bought the 'Spellbound' album in the first week of release, so had known 'Vibeology' for several months by this point. I think it flopped in Australia partly because it seemed to have next to no promotion. I only saw the video once, on Video Hits circa February 1992, months after it had already peaked (though I think it climbed back up the chart later on). But it was this slightly different version - https://www.youtube.com/watch?v=mTeV1cdJ6Ws . Maybe the video wasn't ready yet, as the single was released in Australia before anywhere else. 'Vibeology' very nearly became my first CD single purchase. Wow, I've never seen the first 8.5 minutes of the '2 Legit 2 Quit' video; rage have always edited it. Interesting that Rob & Fab (Milli Vanilli) appear. Not much of a song, though. I hadn't heard the 2009 mix of 'Everybody's Free...' before, but nothing can top the original. 'Spending My Time' is much better than the previous single (and 'Joyride' too, I'd say). I'm pretty sure 'See Right Through' was heavily discounted... to like $0.99 for the CD single, which must have been one of the earliest instances of chart rigging via heavy discounts in Australia. When looking through some ARIA Reports a few months back, I was most surprised to see that 'See Right Through' actually topped the South Australian/Northern Territory state chart around March 1992! Yeah, I did wonder if the Vibeology video had been made when the single was released here. How odd for See Right Through to do that months later, but very good taste on the part of the people of SA/NT. I recall the Kate Ceberano single was sold for a special price of 1.99 for the CD single.